I actually came round to reading anything of Alison Bechdel’s — beyond that simple strip that gave us those rules — through my comics and graphic novels course. I was only very vaguely aware that Alison Bechdel identifies as a lesbian, and not at all aware of her family story. 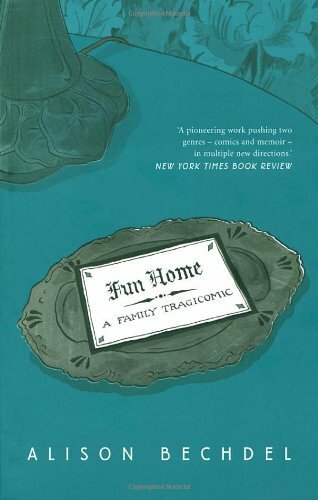 Fun Home is essentially a memoir in comic form, though. I enjoyed the literary allusions quite a lot, and I liked the art style as well. It’s not immensely ornate or anything like that, but it has feeling and personality. To say it has warmth is a bit of a stretch when you’re talking something that deals with such heavy topics and which has such an emotionally distant family at its heart, but you can feel for the characters. Fun Home feels like it was a catharsis for Bechdel, putting into words and images things she’d always felt and not voiced, making parallels that were helpful for her, figuring out links — even engaging in a bit of wishful thinking. It’s interesting how, in my experience of reading this book, there were three levels of acceptance of gay people: not at all (Bruce Bechdel), as part of the women’s movement (Alison Bechdel) and as part of life (me). It opens a little window on what might have been my life. Not everything that Bruce Bechdel did could be excused, and I don’t want to assume too much about Alison Bechdel’s feelings, but I do feel lucky not to be trapped like Bruce and even Alison. ME: Mum, I’m bisexual and I’m dating Lisa. MUM: Don’t cut your hair! You know sexuality is a continuum, right? I don’t want you to label yourself just because of something you’re feeling right now. ME: Dad, if you haven’t noticed that me and Lisa are dating, you’re possibly a bit stupid. ME: Oh. Well, we are. I do still needle my mum about the stereotyping behind “don’t cut your hair” (it was my pride and joy at the time, waist length and thick and a little bit curly — and I’ve since cut my hair pretty short, and she likes it), but… thank goodness for my family and the fact that there was no one walking in front of a bread truck. Alison Bechdel’s father committed suicide, possibly/probably linked to her coming out. Oh I am sorry for her/him. I do wish nobody would feel like that in the world. Your long hair was beautiful but so is your short hair! !